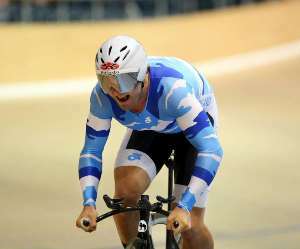 Olympic medallist Simon Van Velthooven dug deep to break his New Zealand record on the opening night of finals at the BikeNZ National Track Cycling Championships in Invercargill. The keirin bronze medallist clocked a stunning 1:00.973 to claim the 1000m time trial on a super-slick Stadium Southland Velodrome tonight. Fellow Olympian Eddie Dawkins set the standard with a strong 1:01.543 before Van Velthooven responded to become the first rider to go under the 1:01 mark in this country, only fractionally under the time he set in winning the bronze medal at the world championships last year. Riding for the Auckland centre, Van Velthooven said he was delighted with his effort given he has been racing solidly since the Olympics. “It has been about managing the form really. On the bike I feel great but off it I am so tired,” Van Velthooven said. “I said tonight that I would love to go 1:00.99 so I went a bit quicker. Dawk set the standard and I had to dig pretty deep to beat it. Fellow Olympians Aaron Gate and Jaime Nielsen claimed titles in the individual pursuit in excellent performances, while Otago sprinter Katie Schofield made her mark with two victories in the 250m standing lap and the 500m time trial, establishing a national record in the process. Gate (Auckland) took out the men’s 4000m individual pursuit in a slick 4:22.076, backing up from a personal best of 4:21.66 in this morning’s qualifying. He almost caught young Christchurch hope Michael Vink, the overall winner of the 2012 national road championship, in an impressive performance. Gate, 22, who won the bronze medal in the team pursuit at the Olympics, was racing in his first track event since London. “It’s been a while since I have done an individual pursuit so to come out here and do a personal best by a long shot and come away with a national title is pretty rewarding,” Gate said. Gate is mixing his time between the track and the road, as he heads to Belgium shortly for his first professional contract with UCI Continental team An Post Sean Kelly with fellow Olympian Shane Archbold. “I have been doing a bit of both. I’ve been slogging it out on the Manukau Velodrome in Auckland and also doing some racing and keeping the miles ticking over on the road. It is almost a hybrid season between the two of them. Fellow Aucklander Myron Simpson produced a strong performance to come from behind to claim the bronze over Southland’s Cameron Karwowski. Nielsen, 27, grabbed her first national individual pursuit title, with world champion Alison Shanks missing with injury. She dominated the final against outstanding Auckland teenager Georgia Williams, clocking 3:35.268 following on from her 3:34.410 in qualifying. Williams held on well to press her team pursuit claims going forward, finishing with the silver in 3:36.955. Nielsen from Hamilton was pleased to show improvement following a long break post London. “I’m using the championships to move ahead. It is pretty nice to gather yourself after London and now after a good break it is encouraging to be making gains quite early in the season. Her fellow Olympic and Waikato Bay of Plenty teammate Rushlee Buchanan took out the bronze medal after overcoming a strong start from Southland’s Laura Fairweather, the multi Paralympic medallist who was pilot for Phillipa Gray in London. Earlier in the day Ethan Mitchell (Auckland) and Schofield won the first title in the 250m time trial. Mitchell, the key starter for New Zealand’s team sprint, claimed back his own New Zealand record in a time of 17.325 ahead of Southland riders Matt Archibold with 17.578 and Eddie Dawkins with 17.917. Schofield also broke her own New Zealand record of 19.595 to secure a gold medal in the elite women’s 250m time trial in a time of 19.326. Southland locals took the other places on the podium, with Stephanie McKenzie claiming silver in 19.730 and Natasha Hansen bronze in 20.211. She came back in the evening to upset national champion and New Zealand holder Natasha Hansen (Southland) in he 500m time trial. “It’s pretty pleasing to get two titles and a national record,” Schofield said. “It is especially so as I had a pretty serious crash a couple of weeks ago in racing. I was pretty banged up but who knows, may be the enforced rest off the bike freshened me up. In the under-19 competition, Canterbury’s Holly Edmondston claimed the 500m time trial in 37.768 ahead of local Laura Heywood, while Alex Hooper (Mid South Canterbury) outlasted another Southland star Jeremy Presbury in the 1000m time trial in 1:03.733. Invercargill’s Josh Haggerty went solo in the 10km scratch race but was unable to hold on, edged by Auckland’s Chad Elliston and Hawkes Bay’s Regan Gough in the final straight. The championships continue until Sounday. Women 3000m individual pursuit, gold medal ride: Jaime Nielsen (Waikato BOP) 3:35.268, 1; Georgia Williams (Auckland) 3:36.955, 2. Bronze medal ride: Rushlee Buchanan (Waikato BOP) 3:40.778, 3; Laura Fairweather (Southland) 3:41.673, 4. Men 4000m individual pursuit qualifying: Gold medal ride: Aaron Gate (Auckland) 4:22.076, 1; Michael Vink (Canterbury) 4:29.254, 2; Bronze medal ride: Myron Simpson (Auckland) 3, Cameron Karwowski (Southland) caught, 4. Women 500m time trial: Katie Schofield (Otago) 34.993, 1; Natasha Hansen (Southland) 35.168, 2; Stephanie McKenzie (Southland) 35.367, 3. Men 1000m time trial: Simon Van Velthooven (Auckland) 1:00973, 1 (NZ Record); Eddie Dawkins (Southland) 1:01.543, 2; Cameron Karwowski (Southland) 1:02.732, 3. Men’s 250m time trial: Ethan Mitchell (Auckland) 17.325, 1 (NZ Record); Matt Archibald (Southland) 17.578, 2; Eddie Dawkins (Southland) 17.917, 3; Sam Webster (Auckland) 17.969, 4. Women’s 250m time trial: Katie Schofield (Otago) 19.326, 1 (NZ Record); Stephanie McKenzie (Southland) 19.730, 2; Natasha Hansen (Southland) 20.211, 3; Paige Paterson (Auckland) 20.334, 4. Women 500m time trial: Holly Edmondston (Canterbury) 37.768, 1; Laura Heywood (Southland) 38.671, 2; Alice Hay (Canterbury) 38.815, 3. Men 1000m time trial: Alex Hooper (Mid South Canterbury) 1:03.733, 1; Jeremy Presbury (Southland) 1:04.577, 2; Zac Williams (Auckland) 1:04.607, 3. 10km scratch race: Chad Elliston (Auckland) 1, Regan Gough (East Coast North Island) 2, Josh Haggerty (Southland) 3.